600 Tornadoes With Nothing To Say? Editor: Last month during mid-April, Patty and I spent a week in Atlanta and the hills of northern Georgia. In our third night in the region, we were subject to a “tornado watch” until 3 a.m. So, never even being near a tornado, much less on a ‘watch’, we stayed up for the duration – while our hosts – accustomed to such – snoozed. In April we experienced 600 tornadoes in the US. Last year the count for April was 110. The six fold increase is an astounding climate change. But how did 600 twisters happen? And why? In our public reports such basic questions are strangely restricted. No connection is made to other years, or to the other natural disasters – that long trail of shattering events leading back through time, today’s Mississippi floods, last week’s riot of tornadoes, before that the earthquake and tsunami in Japan, before that the Brazilian mudslides, the Australian floods, the Chinese quakes, the Pakistani floods, the Haitian and Chilean quakes, the Russian summer of fires… We self-censor in a very strict way. Why? Why are we afraid to apply common sense questions to the most impactful experience the Earth offers? Very quickly we slide from the denial that such things have a living origin – all the way to the utter meaninglessness of natural events. This is uniformly the position of the leaders of nations, corporations, armies, religions and the arts. The leaders of our biggest institutions share a silence on the subject, and have for years. Now just think. The physical systems of the Earth, the very air and water and ground that make our lives possible – cannot be openly and creatively discussed? Hey, we’re in trouble here! But as each tragedy unfolds, we tabloidize our reports into the usual heroes and victims, and the Earth, which would seem to have had a role this apocalypse, is left as a background figure. The Earth can cause the tsunami or tornado or devastating flood, but it loses the audition and is not cast in a lead role in the habitual plotting of our stories. In the face of monstrous disasters we find a way to consign the natural world to the background. We fear the idea of Earth-life. When we stick to those emotional “human interest stories” and value-neutral reports (like weather reports) – then something paradoxical happens. When we demote the Earth we dismiss ourselves. Since the earth scientists tell us that we are the cause – we must take these evasive maneuvers to escape our own guilty role. This leaves us with such spectacles as three thousand words in the newspaper of record never suggesting that the 600 tornadoes are a response to the heating of the planet by human activity. We don’t want the 600 tornadoes to mean anything. That would be as if they were attempting to converse with us. And – tornadoes can’t talk, can they? A student of the writers Charles Gaines and Kurt Vonnegut, Reverend Billy Talen moved to New York City in 1994 and joined the sidewalk preachers of Times Square, specializing in exorcisms of sweatshop companies such as Disney and Wal-Mart, and opposing the gentrification of neighborhoods. Reverend Billy and the 35-voice Stop Shopping Gospel Choir perform “”The Church of Earthalujah” every Sunday night in New York City’s East Village. Where’s Bill Paxton, and Linda Hunt when you need them? 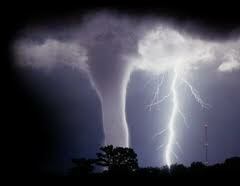 I just saw parts of that movie – “Twisters” – a love story sandwiched between tornadoes. LOL, entertaining movie. I hadn’t seen the move for a long time until last weekend. Any one unfamiliar with”‘Reverend Billy should make a point to check his trip out. He makes sense to me. Maybe others would benefit from a little honest philosphy. Newer Article: State of Emergency Rally, San Diego – Friday, May 13 from 4-6 p.m.